Companies continue to seek new ways to avoid the complicated and burdensome process of building, operating and managing their own data centers. As a result, organizations increasingly take a more efficient route and spin up environments in the cloud. Migrations to the public cloud model, especially, will continue to be one of the biggest data center industry trends in 2017, said Sophia Vargas, an infrastructure and operations analyst at Forrester Research. That interest comes from all angles, she said -- especially from the lines of business. 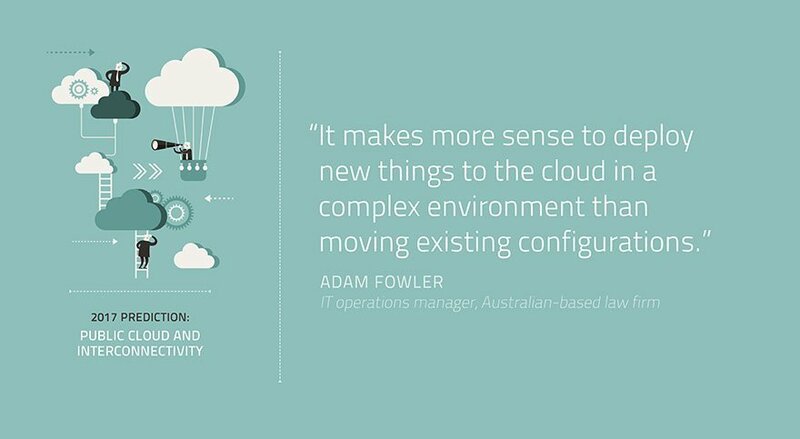 The next year will be very cloud-focused for IT organizations, said Adam Fowler, an IT operations manager for an Australian law firm and a TechTarget contributor. "I expect to see some more VMs, software-as-a-service and platform-as-a-service setups in Azure -- mainly for new projects, because it makes more sense to deploy new things to the cloud in a complex environment than moving existing configurations," he said. More than half of larger organizations will probably not build a new data center in the next four to five years, predicted Richard Villars, vice president of data center and cloud at IDC. As such, colocation providers are keenly aware of enterprise interest in the public cloud model. Many providers will continue to add interconnectivity -- a specific service often found in colocation marketplaces that provides dedicated, high-performance connections to public cloud platforms. These services suggest colocation providers will continue to position themselves as an interconnected ecosystem, serving not just as alternative facility providers, but as a highly interconnected meeting place to take advantage of other types of services, Vargas said. What is your organization's public cloud adoption strategy?